1. Check your tires! Wet or icy roads can be dangerous. Make sure that your vehicle’s tires have adequate tread, and that they are inflated to the correct tire pressure. With the inevitable Midwest snowfall, snow tires are also a great option for getting better traction. 2. Change your oil. The colder winter temperatures cause oil to thicken, which can cause damage to your engine. During winter months a lower viscosity oil should be used. 3. Give it a wax! Giving your vehicle a wax before winter can help protect your paint from the corrosive combination of moisture and salt on the roads. 4. 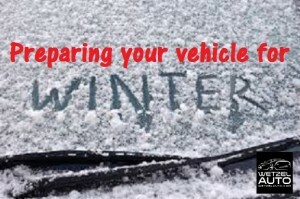 Winterize your wiper blades. Regular wiper blades struggle to remove snow and ice. Switching to winter wiper blades ensures visibility in bad weather. Also, switching to a winter wiper fluid will keep the reservoir from freezing, causing a hefty repair. 5. Check those belts and hoses. It can’t hurt to bring your vehicle in for a tune up before the hard winter months get here. Make sure that all of your belts and hoses are in good condition! These tend to become more brittle in the cold and could likely snap or break. 7. Fill up your tank! During the cold months of winter, moisture can build up in your tank and cause damage. This can be prevented by always keeping your gas tank above half full, this way the gasoline can absorb any moisture before it starts to build up. 8. What to pack in your vehicle. Keeping items such as gloves, scrapers, snow shovels, tire chains, kitty litter, road salt, or sand in your vehicle can come in handy for getting out of sticky situations in winter weather. Service Advisor Zack Crawford, from Wetzel Chevrolet, gives a little advice on making sure your vehicle is ready for the cold weather ahead.